As soon as you set foot on Gili Air, you’ll feel your body and soul fill up with an extreme sensation of relaxation. Eco friendly island – there are no motorized vehicles on Gili Air, the only way to get around is with the wonderful local horsecarts (Gili taxi), by bicycle or by foot. The friendly locals will help you climb aboard a horse- cart, to ensure your safe arrival at Slow – Gili Air, private pool villas. The island has plenty of things to do. It is surrounded by white sandy beaches, crystal clear blue water and pristine coral reefs. Ideal for snorkeling, scuba diving, surfing and any other water sport. Gili Air is located in the coral triangle, which is an area in the tropical marine waters, where the biodiversity underwater is the most developed in the world, 50% more species are discovered here then in the Red Sea. You can see up to 15 turtles on a dive. The Gili Islands consists of three islands: Gili Trawangan, Gili Meno and Gili Air. Located between Lombok and Bali. There are no motorized vehicles on the islands, the only way to get around are horse carts, bicycles and off course, by foot. Most of the locals depend on tourism, meaning that the majority of restaurants and hotels are owned by locals. The white beaches, coral reefs and the crystal clear blue waters surrounding the Gili’s, attract many visitors. There are many different activities besides swimming and sunbathing on Gili Air and the surrounding islands. Ask us at reception, we can help you book everything! 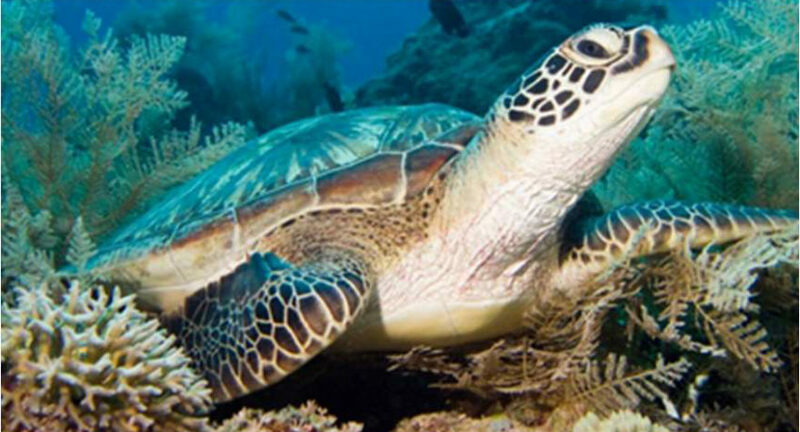 Gili Air is a fantastic place to learn how to dive; great visibility, diverse marine life, an abundance of turtles, knowledgeable instructors and high quality dive schools. We recommend our guests visit Blue Marine Dive, a well establish school with great attention to detail and a fun atmosphere. A few of our managers work part time there as instructors…. Perhaps you could to learn to dive with one of the Slow family?! All PADI courses are available through to Dive Master. Ask us for more information. Meet your instructor and learn some basic diving science and safety tips. Then jump in the pool and take your first breath underwater, learn some fun skills and swim around with fins, mask and your scuba equipment on. Finally take your new skills into the ocean and do a full dive to a maximum of 12m! The Scuba diver certification takes 2 days. It consists of the 3 first chapters of the Open Water Course, which includes theory, pool sessions and 2 Open Water Dives in the ocean. The Scuba Diver certification gives you the possibility to dive until 12m, for life, accompanied by a dive professional. To upgrade to Open Water Diver, you’ll need to complete 2 more chapters, pool session and 2 Open Water Dives in the ocean. The Open Water Course takes 3 days. It consists of 5 chapters, which includes theory, pool sessions and 4 open water dives in the ocean. The Open Water certification gives you the possibility to dive until 18m, for life. It makes you an independent diver. Which means that after completing this course, you are certified to dive without a professional, with your buddy! It gives you full knowledge of scuba- diving! The Advanced Open Water Course takes 2/3 days. It consists of 5 adventure dives. The main goal is to make you a better diver! More practice, less theory. This course will introduce you to various kinds of diving, depending on your preferences. The Advanced Open Water certification gives you the possibility to dive until 30m (21m Junior Advanced), for life, independently with a dive buddy. Price Advanced Open Water: 2 or 3 days / 4.500.000 IDR / minimum age 12. The dive boats leave 2 or 3 times per day. You can go and explore the Geln Nusa wreck at Jack Point, find more than 20 turtles at Turtle Heaven, look for cool Macro and Nudibranchs at Hans Reef, spot a few sharks at Shark Point, and maybe even see something rarer like an Eagle Ray cruising past the slope at Halik Reef! This course will enable you to feel safe and comfortable when freediving to depths of up to 20 metres. Although this might sound difficult to achieve in a few days, you will be surprised what an experienced team of Freediving Instructors can do for you. Our unique breathing techniques, together with the effective structure of the course program in the classroom and water sessions, creates a fun educative environment and a successful freediving experience. session. During our water sessions we have a normal ratio of 2 students for 1 Instructor, with an absolute maximum of 3 students for 1 Instructor, which allows for greater personalised attention and tuition. Your Instructor will be with you at all times, regardless of depth, increasing your confidence and safety. On completion of the Freediver Course, you will receive your certification as well as private online access to the Freediver Course materials, so that you can maintain and refresh your freediving knowledge. Try out yoga on a SUP board, jump in the clear water when you get too hot, and laugh when even the instructor falls in! Beginner welcome…bring a cap/sunscreen! Gili Air’s Bongkas reef has a barreling right-hand break off the south coast. It breaks over some very sharp coral and is best left to experienced, skilled surfers. It doesn’t always roll, but when it does this is a good wave. First stop for any surfer is Lucky’s Bar, where the local crew will be keen to chat about the conditions.